A particularly well presented and appointed, gas centrally heated, sealed unit double glazed, four bedroomed, detached family house with single integral garage, additional off-road parking, a good sized, landscaped rear garden and spacious, well arranged accommodation including a canopy porch, entrance hall, fitted cloakroom, lounge, dining room, well equipped and fitted breakfast kitchen, four good bedrooms (master with en-suite shower room) and separate family bathroom, situated in this convenient and sought-after, edge of Charnwood Forest village. EPC TBC. General Information: - The sought-after village of Groby is located just outside the Leicester City boundary, to the north-west, and is well known for its popularity in terms of convenience for ease of access to the afore-mentioned centre of employment and all the excellent amenities therein, as well as the market towns of Hinckley, Market Bosworth, Ashby-de-la-Zouch, Coalville, Loughborough and Melton Mowbray, the East Midlands International Airport at Castle Donington, the A46 Western By-Pass which links Groby with Nottingham in the north and Junction 21 of the M1M69M42 major road network in the west for travel north, south and west, and the adjoining Charnwood and New National Forests with their many scenic country walks and golf courses. Groby offers a good range of local amenities including shopping for day-to-day needs, schooling for all ages, a wide variety of recreational amenities including the nearby Martinshaw Wood, Groby Pool and Bradgate Park, excellent golf courses at Rothley, Lingdale, Kirby Muxloe and Botcheston, and regular bus services to the Leicester City centre. General Description: - Situated in this sought-after, edge of Charnwood Forest village, this spacious, four bedroomed, detached house offers particularly well presented and appointed accommodation briefly comprising entrance hall, fitted cloakroom, two reception rooms and a breakfast kitchen. 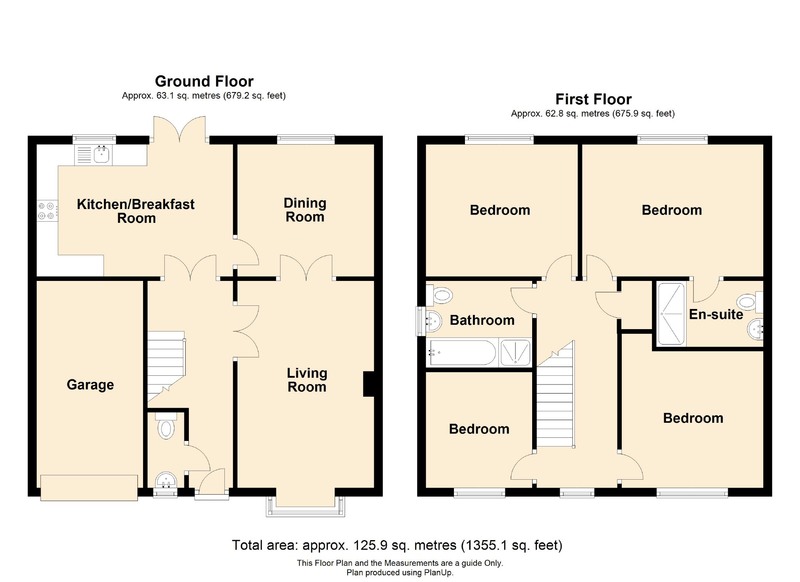 To the first floor are four good bedrooms, a family bathroom and an en-suite shower room to the master bedroom. The property also benefits from a single integral garage, additional off-road parking for one vehicle and a good sized, landscaped rear garden. Fitted Cloakroom - With two-piece white suite comprising low flush w.c. and pedestal wash hand basin with tiled splashback. Also with tiled floor, central heating radiator, ceiling light fitting, Xpel-air extractor fan and sealed unit double obscure glazed window fitted with venetian blind. Breakfast Kitchen - 16'5 x 9'9 (5.00m x 2.97m) - With units and equipment including single bowl stainless steel sink and drainer unit with hot and cold mixer tap inset to U-shaped rolled edge worktop with range of drawers and cupboards, space and plumbing for both automatic washing machine and dishwasher under and sealed unit double glazed picture window over. Integrated equipment including 'Zanussi' split-level cooker comprising oven and four-plate gas hob with stainless steel splashback and cooker hood over inset to a range of four eye level wall cupboards. Also with ceramic tiled floor, central heating radiator, two clusters of quadruple spotlights and twin sealed unit double glazed French doors to rear garden terrace. En-Suite Shower Room - With three-piece suite comprising fully tiled shower enclosure fitted with wall-mounted shower unit incorporating flexi hose to sliding track, together with glazed shower door and screen, pedestal wash hand basin with tiled splashback and low level w.c. Also with central heating radiator, electric shaver point, ceiling light fitting and 'Xpel-air' extractor fan. Bedroom 2 (Rear) - 10'1 x 11'8 (3.07m x 3.56m) - With sealed unit double glazed window fitted with venetian blind, central heating radiator and triple spotlight cluster. Bedroom 3 (Front) - 10'10 x 11'8 max. (3.30m x 3.56m max.) - With central heating radiator, triple spotlight cluster and sealed unit double glazed window fitted with venetian blind. Bedroom 4 (Front) - 8'7 x 8'4 (2.62m x 2.54m) - With sealed unit double glazed window fitted with venetian blind, triple spotlight cluster and central heating radiator. Family Bathroom - With four-piece white suite comprising fully tiled shower enclosure with wall-mounted shower unit incorporating flexi hose to sliding track, together with folding glazed shower door, panelled bath with tiled splashback, pedestal wash hand basin with tiled splashback and low level w.c. Also with tiled floor, central heating radiator, ceiling light fitting, 'Xpel-air' extractor fan and sealed unit double obscure glazed side window fitted with venetian blind. Outside: - The property enjoys a lawned front garden with hedged boundaries and a side driveway providing off-road parking for one vehicle and giving access to a SINGLE INTEGRAL GARAGE measuring 17'4 x 8'2 with metal up-and-over door, electric light, power supply and wall-mounted gas fired central heating boiler also supplying domestic hot water. Landscaped Rear Garden - The good sized rear garden has been landscaped to create a patio area with an adjoining decked verandah and an area of lawn with well stocked borders of shrubs and bushes and a variety of trees. Boundaries are fenced for privacy. Fixtures And Fittings: - All fixtures and fittings mentioned in the sales particulars, together with fitted floor coverings, light fittings and blinds, are included in the sale. Directions - The property is most easily approached from Leicester on the A50 and at the large A46 roundabout junction taking the first exit, marked for Groby. This is Leicester Road and takes you across a bridge over the A46 and another small roundabout into Groby itself, where the first turning on the right is Anstey Lane. However, as Leicester Road is a dual carriageway, at this point, you have to go on a short distance to the first opening and double-back, coming to Anstey Lane on the left. Proceed up Anstey Lane, turn right into Branting Hill then left into Stonelodge Road where No.7 Is a little way down on the left hand side.